NUK First Choice Medium Hole Size 2 Silicone Teat is ergonomically designed with the special orthodontic NUK shape. 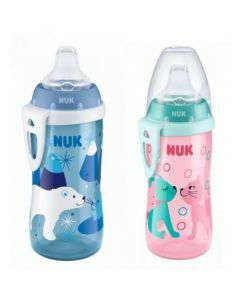 They feature the special, orthodontic, asymmetrical NUK shape, an extra wide lip support and new extra soft tip to fit baby's mouth perfectly, simulating breastfeeding as closely as possible. It so true to nature that most babies hardly notice the difference. Suitable for 6 to 18 month. Cold water sterilisation or NUK Steam Microwave Steriliser.